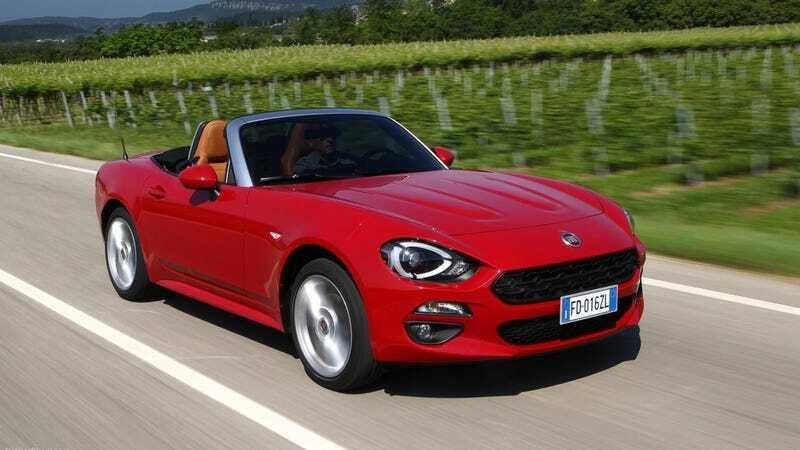 You may think you know everything about the 2016 Fiat 124 Spider, thanks to its damn-near-perfect Mazda Miata heritage, but you don’t. So take a tour of the car with us live, right now. I’m on the Fiat 124 press drive today, and Driving Impressions Are Officially Embargoed until Saturday, to give everyone a crack at it first. That means I can’t tell you whether the handling is good and/or bad, and I can’t tell you whether the engine makes you sing sweet songs of joy and/or makes you scream out death throes of rage. But I can show you every single angle, I can tell you the specs, and you can listen to the Abarth 500-sourced mill. And, because I actually asked this, I can tell you if I am Happy or Not Happy. Join us on our Facebook page for the tour, or just watch the embed below.